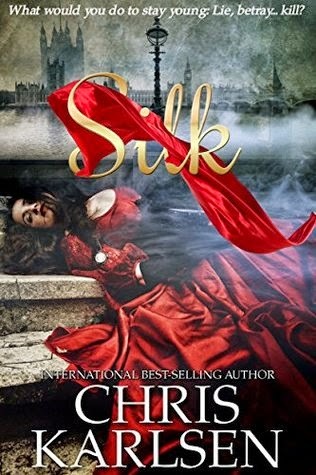 Silk by Chris Karlsen is the first book by the author that I have read. This book is a serial killer, murder mystery set in Jack the Ripper's era of havoc in England. Where one side Jack the Ripper is keeping the people of England edgy, on the other side there is another vicious serial killer leaving a trail of dead bodies. This book is different from our normal mysteries. It is more darkly sketched with a black and white description of a historical era. I loved Chris' expertise in creating a sinister world with a devious killer. She has a way with words and created the most haunting visuals in my mind. The author is able to give an insightful tour of a serial killer's mind to the readers which had a chill running down my spine. Her contrasts between the thinking patterns of the hero and the killer are most profound and very enlightening. The settings are realistically developed and the danger feels most real like it is truly there. I felt frightened and tempted to go double check the locks! The crimes are well described and despite being honest, are not gritty as I had feared them to be. The characterization is admirably done but still this is one book where the villain overshadows the hero and I will remember him for a long time. That being said, the real shine and allure is added through descriptions of the settings and events, the author's writing style and the enlightening study of human nature that this book presents. The only point that needed more work is the tension in the mystery. The mystery unfolds too soon and the tension after that is loose which had it been more tight would have definitely made this book a full 5 star book from me. All in all, Silk was an entertaining read that I absolutely enjoyed reading. It kept me at the edge of my seat and I got goosebumps reading the story. 4 out of 5 to it and recommended to all mystery and historical fiction lovers. I am happy that I found Chris and will be checking out her other books too. She is a talented author and I wish her the very best. I received a copy of the book from the author and the tour organizers. The above review is my honest and unbiased opinion and in no way influenced. 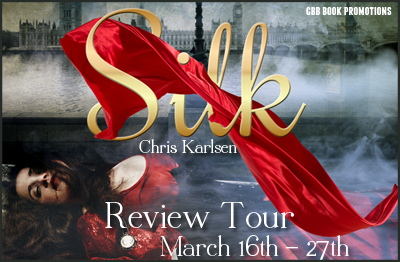 Each tour stop is giving away one kindle copy of SILK, just comment to enter!